My mum and my sister have a fabric business and one of the perks for me is cheap fabric! On their last buying trip I asked them to look out for a few metres of wool to make the kids new Winter jackets. Typically, they couldn't settle on just one, and shipped back more than a dozen metres of gorgeous wool/cashmere and plain wool. Heaven! I have had the Oliver + S School Days Coat pattern for a while but have never tried it out due to not having had the 'right fabric'. Now I do! The jacket was surprisingly simple to make. It's a lot of work (if anyone knows of a company that will trace off and cut our your pattern pieces for you, please let me know) but all very straightforward. The instructions also had a few tips for working with wool, such as grading the seams and having a wider topstitch, and they gave really nice results. I was intimidated by working with wool but it was so forgiving. Lots of ease so setting in the sleeves was a piece of cake, and it was even nice to cut out. The lining is a quilting cotton by Sandi Henderson - medallion bloom from her Farmer's Market collection. It's one of my favourites but I wasn't sure about using it for the coat. In any case Sweetpea decided she had to have it, and I'm pretty happy with the result, even though I would have preferred something to contrast with the pink wool. The jacket fits really well, with enough room to layer a jumper underneath it. Sweetpea adores it! I'm working on my son's coat now and am really excited about it. I love that's he's still too little to have any say in the fabric choices, so his jacket is just how I want it. 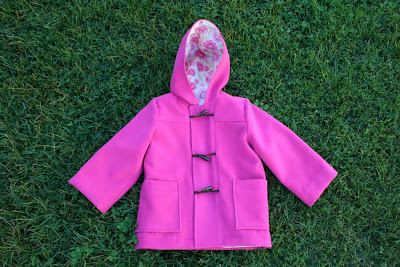 The finished coat. I choose to use toggles and leather cord rather than buttons. The coat has the option of concealed snaps or velcro. I chose velcro as it's easier for the kids to mange on their own. The lining. Sweetpea's choice but it's not too bad at all. 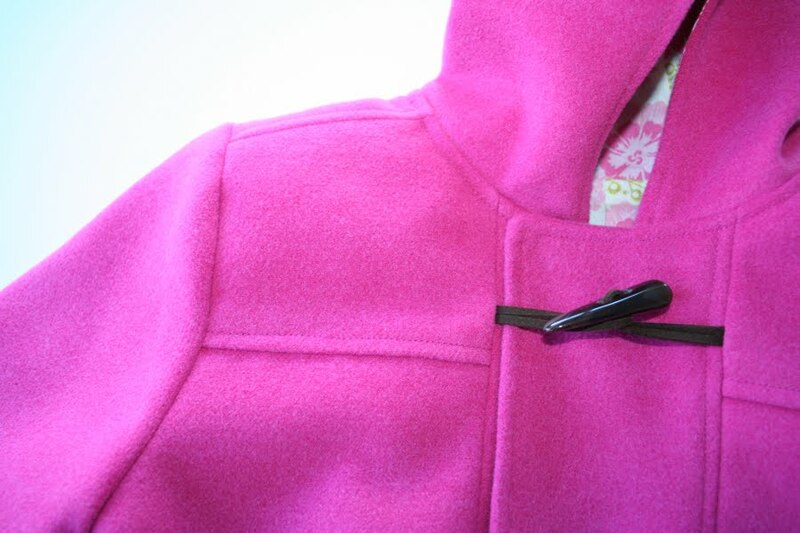 The jacket has lots of topstitching. I followed Liesl's tip and made mine a quarter inch, and love the results. I pre-treated the wool by hand-washing it in woolwash then laying it flat to dry. I plan to wash the coat in the same way. Breath taking, I loved making this coat too. I love the colours and the toggle closure! Top stitching looks perfect! Thanks for the tip re pretreating the wool - I've got some waiting to be cut but wasn't sure if I should wash it first. Thanks everyone! Justine I was nervous about washing the wool but it was fine. The main thing is to squeeze the water out rather than rubbing, spinning or wringing, as that can cause it to felt. It's just perfect! I am so intimidated by this pattern! I should go buy the pattern now! It's absolutely beautiful! You did a fantastic job on it! Beautiful! 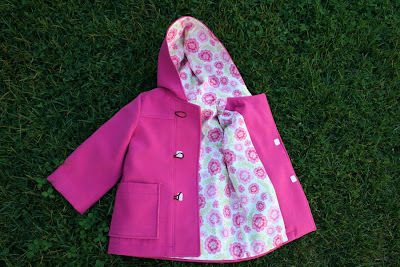 I love the colours and the coat looks beautifully stitched. Like you, I wash my wool as well and hang to dry. I have a front loading machine and use that for washing so I don't hand wring it and I have never had a problem. Wow thats gorgeous. 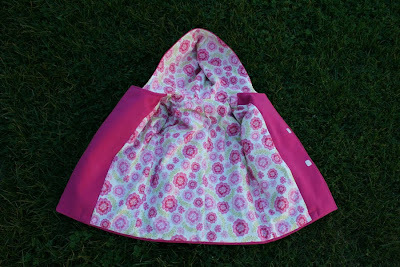 I love toggles too, I think they are so much easier for kids to do than buttons. Well done. This is one of the O=S patterns I don't have but now wish I did! The jacket is beautiful Claire - no wonder Sweetpea loves it.